I am writing here very rare, approximately 1-2 times per year, so if you came here, it means that you were looking for something related to me. Here are some links to information sources that can help you to find more about me. It is easier to keep eye on my facebook or twitter. a Kushik family website, which, I hope, will turn to something more valuable. This blog, which is still maintained and blog in Russian which was fork from this blog several years ago. 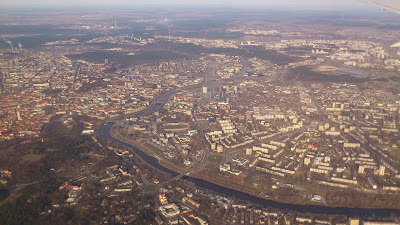 my photoblogs about Riga and Vilnius. Also, check twitter for Riga Photos. Mt travel blog about USA. Youtube channel contains also some interesting videos related to me and Picasa albums. BTW, here is website for free online games, games blog and its twitter. At birthday party friends asked him about plans to finally finish the school. After realizing that he stayed 5 years in the same grade, he promised everybody to never miss the lessons again and start to study hard. Next day school director expulsed him because he became 18 years old. This happened to me when I was traveling from Riga to Saint Petersburg by Bus. It was during November and there was no snow at that time in Riga, but driving deeper inland has had a lot of snow. The first stop was at Russian border check point. After passport checking, I went out of the bus and quickly took a picture of the snow lying next to the bus. I regret doing that. "А ты что там делаешь?" meaning "What are you doing there?" I understood he was shouting to me, I answered that I just took a picture, his reaction was quite serious. He gave the order to not let the bus going until his official permit. He grabbed me to the back office and start to prosecute an inquiry. After they have looked at the picture where was the white snow only, they blamed me that I took picture of Top Secret Military objects like Water Pump, Fence, Gates and so on. After that he had made several phone calls, and told me that the General is already on the way to take prompt actions and I will stay here for couple days until they will check that I am not a spy. I knew that they want a bribe, but I didn't want to give them any money just because they asked. But I knew as well that they have a right to keep as long as they want. I was scared, and I think that my pupils became dilated because of fear. After couple minutes another officer came in the office, cast a glance at me and claimed that I am junky boy and just got high. After that they start my luggage examination trying to find any drugs there. They checked not only every single little thing in my bag, but the clothes on me as well. Hopefully only outerwear. All this time I was trying to speak less, and pretended to be stupid. After haven't found anything illegal in my baggage, they told me to pay a fine one hundred euro because of taking pictures. I told that there is only the snow, and I will not pay any fine. They have looked at the picture again.. And said - Okay, format the memory and we will let you go. There was just one picture, so I did format without objections. When I came back to my bus, everybody was waiting for me.. The bus driver asked, how much money they took? I said that I didn't gave them anything. He wondered and replied that I am very lucky. Today i've run a new blog for my Flash Ghetto website network. For now there is nothing, but soon there will a be a lot of reviews for best flash games.